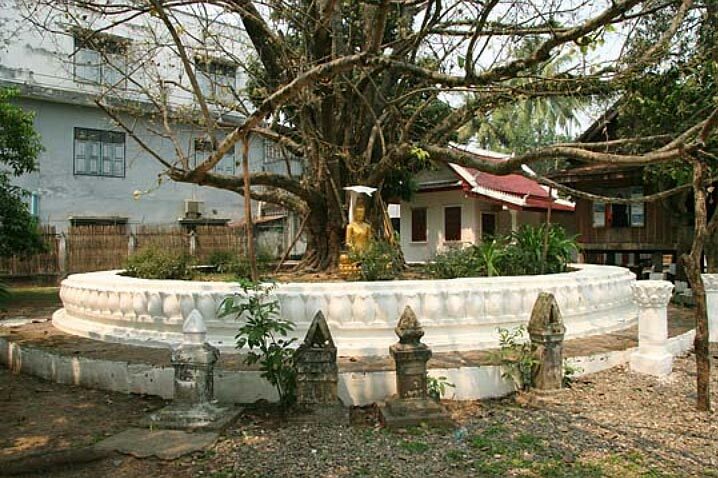 Wat Visoun, the oldest temple in the city and his stupa That Mak Mo. 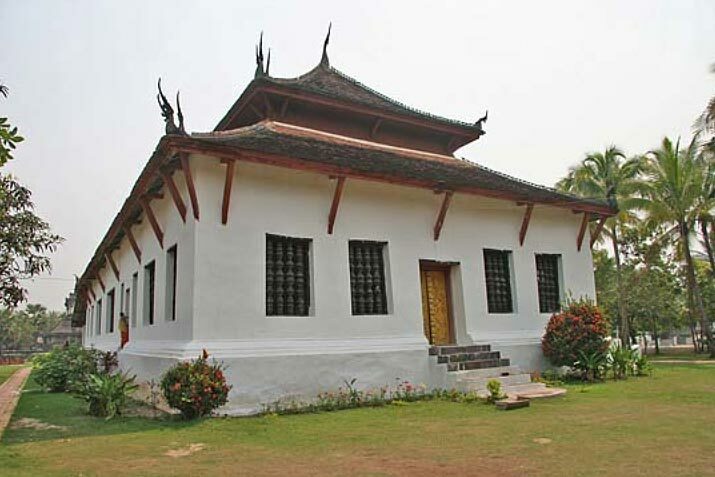 Wat Visounnalat was originally built during the reign of King Wisunarat (or Vixoun, 1501-1520) in 1513 (some suggest 1512) and represents the earliest style, sometimes referred to as Luang Prabang Style I, of Lao temple architecture. 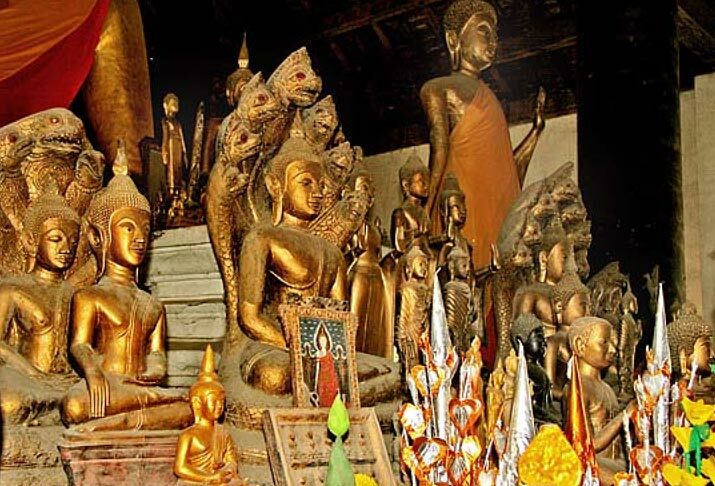 This style also includes the sims of Wat That Luang and Wat Mai. 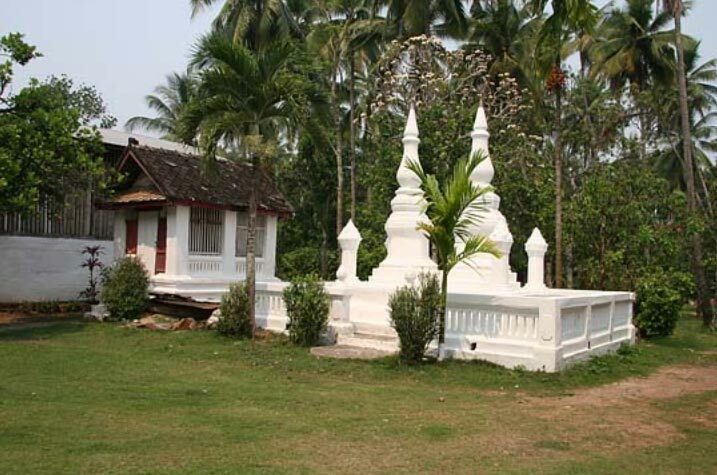 Wat Wisunalat is Luang Prabang’s oldest operating temple. As with the sims of most Lao wats, there are multiple roof structures. In the Style I form the first and second roofs extend around the entire perimeter of the structure. 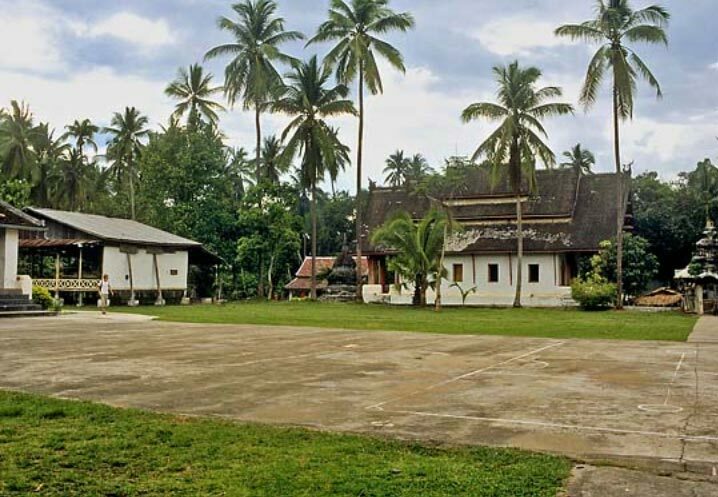 Except for the sim at Wat Mai, which was embellished by two additional gable roofs and two roofed side galleries, the style evokes simplicity, since the sim employs neither the high peaks of the gable nor the dramatic low sweeping roofs of many of the other sims of Luang Prabang. Located and adjoining Wat Aham to the southeast, it was probably built on the rice fields of the guardian spirits of the city (devata luang), Pu No and Na No (Phou Nheu and Nha Nheu). 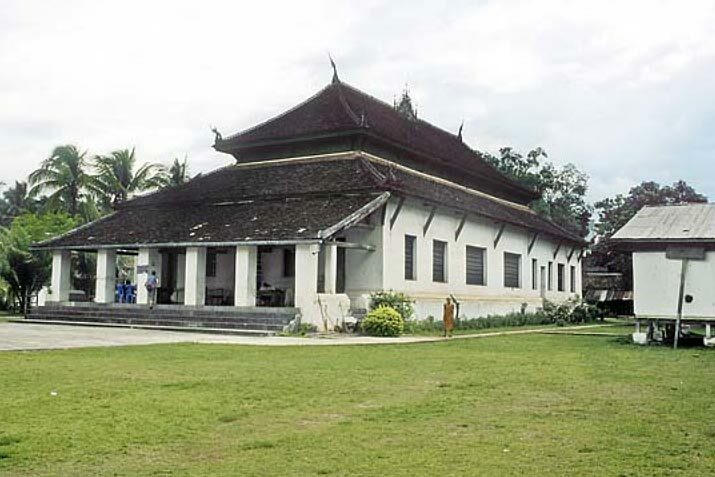 The sacred Prabang image was housed in the sim from 1513 until it was taken to Vientiane in 1707. The original highly ornate wooden sim was a spectacular example of Lao craftsmanship at its finest and was one of the most imposing religious structures of old Luang Prabang. It had a double roof with the upper roof raised high above the lower roof. It was over 118 ft. (36m) long and 59 ft. (18m) wide; perhaps 4,000 trees were used in its construction. Each of the twelve pillars supporting the roof was almost 100 ft. (30 meters) high. 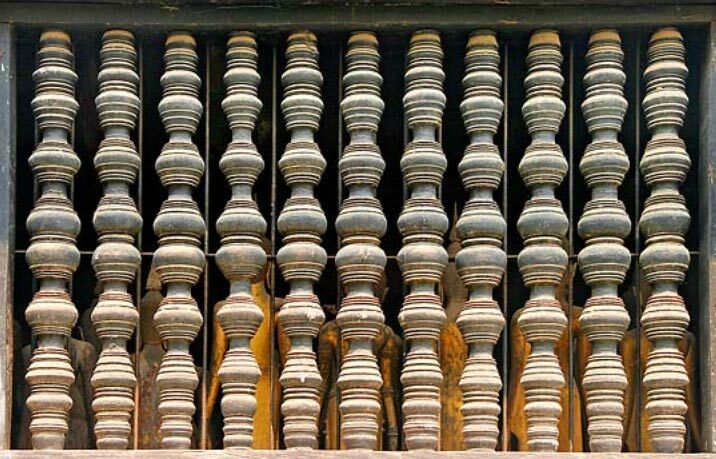 There were twenty-one windows with turned wooden balustrades. Louis Delaporte’s engraving of its appearance in the 1860s is included in the series of photographs that follow on this site and shows the unique character of the sim. 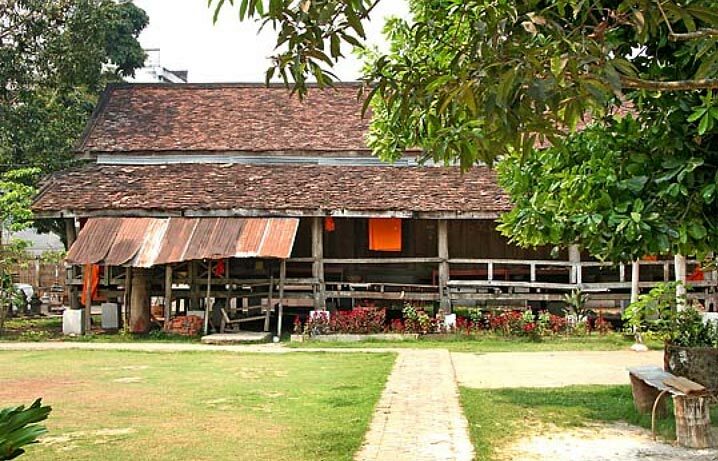 Most of the partitions of the original building were carved wood, and the exterior, as portrayed in the engraving, made it one of the most beautiful in Luang Prabang. It also housed a major collection of rich religious objects and other "objets d’art". 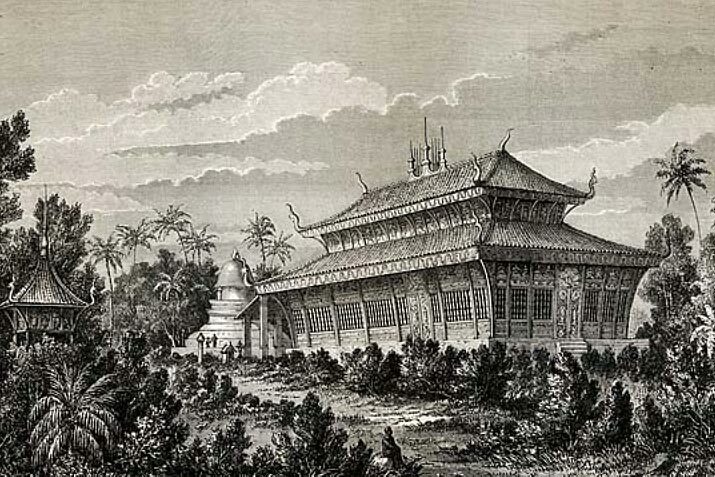 Much of the sim and the city were destroyed during the invasion of the Chinese Haw Black Flags marauders in 1887. The sim was rebuilt between 1896 and 1898 and during the reign of King Sakkarin Kamsuk (r. 1894-1903). The style was somewhat to the old sim with its numerous massive wooden beams, window placement and style of the roof, albeit the major part of the structure was brick and plaster in place of the wood. The window balustrades attempt to capture the flavor of the older turned wooden balustrades of the original sim. The sim today continues its existence as a valuable of museum religious art with numerous centuries old Buddha statues in bronze and gilded and unadorned wood, ordination precinct stones and other religious objects. Another important and prominent feature of the wat is its unique That Pathoum, or Stupa of the Great Lotus, in the front and northeastern side of the sim. It is known more popularly as That Makmo, the "Watermelon Stupaï" because of its rounded dome. 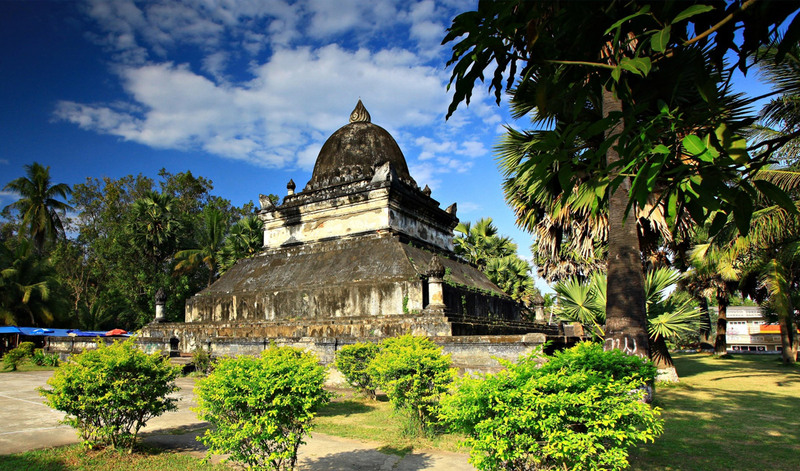 The dome stylistically reflects a Sinhalese influence and is the only stupa of such a shape in Laos, and perhaps even in Cambodia or Vietnam. Originally erected between 1514 and 1515, it was destroyed during the Haw Black Flag incursion in 1887. Inside were numerous ancient Buddha images. Many were destroyed; a number are in the National Palace Museum, and some are in the sim itself. 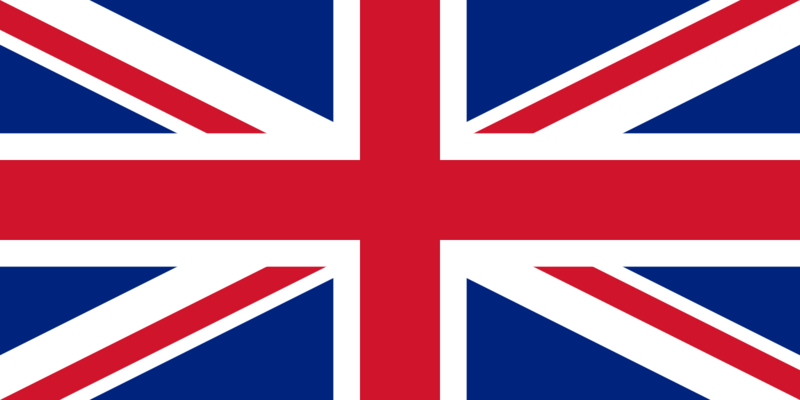 Its reconstruction was not seriously undertaken until the late 1920s, over thirty years after the reconstruction of the sim, and was completed in 1932. The stupa sets on a number of different square tiers and has a Lao-Buddhist style Usnisa crown at its top.